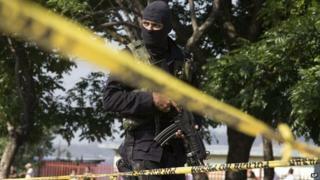 Honduran authorities are investigating the deaths of at least seven children who may have been murdered after refusing to join criminal gangs. In the latest case, police found the body of a seven-year-old boy who appeared to have been tortured. His 13-year-old brother was found dead a day before. All the crimes took place over the last month in an area dominated by street gangs in the industrial city of San Pedro Sula. Correspondents say most of the violence is caused by the constant battling between the country's main maras, or street gangs - Mara 18 and Mara Salvatrucha - which have claimed tens of thousands of lives. Honduras' attorney general, Oscar Fernando Chinchilla, travelled to the northern city on Friday to oversee the investigations. The attorney general insisted the involvement of criminal gangs was just one of the lines of investigation. Police investigators, however, had already said they believed street gangs were behind the killings. The violent maras are also believed to be responsible for thousands of killings in neighbouring Central American countries such as El Salvador and Guatemala.